Elvy Lifestyle brings you an exclusive range of PLATINUM DOUBLE WALLED TEA SET/COFFEE MUGS. New double-walled collection is made of borosilicate glass which is insensate to extreme variations in temperature which makes the tea/coffee stays hotter for longer, but the outside temperature of your glass remains cool. Elvy is not something you usually find in every house. The unique style of the collection surpasses the global fashion precincts. This stylish is perfect for a classic party. 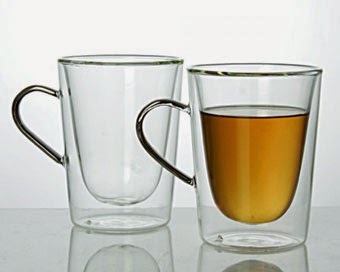 So go English and serve tea/coffee in these classy double wall cups which are designed with a platinum rim and silver handles. Elvy's product categories include Serving, Kitchen, Bar, Decor, Office, Games, Bath, Outdoor, Travel, Teens and Junior’s. Elvy gives contemporary, exclusive and stylish options to set up a great home from showpieces, glittering accessories to artful servings. Elvy has also been known for its sensational festive collection, be it Diwali, Christmas or even Holi, so one can gift the most unique items from the world over.